Teaching on the secondary level can be challenging with the number of students that we are required to teach each year. In my personal experience, I have seen the number of students in my classroom increase from 150 to 170, and I have a sinking suspicion that these numbers are going to continue to increase as time goes by. Therefore, it is essential as a secondary teacher to develop strategies for more efficient grading practices and to rethink our roles as teacher-auditors rather than graders. 1. Don’t be afraid to expect students to turn in work in a specific way that will make it easier for you to grade. For example, if it’s easier and faster for you to grade an assignment that is stapled in chronological order, then make that part of the grade. If it is easier for you to grade an assignment if all of the headings are highlighted, then make highlighting part of the grade. Students always need to practice following directions, so this is good for them and good for you. It's a win-win situation. 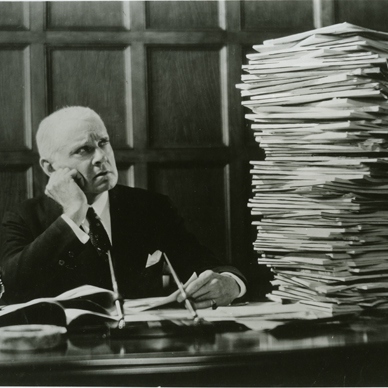 If you have to spend an extra five minutes searching for one piece of paper for one student, it could add up to hours of extra grading time if you need to search for that piece of paper for 100 students. So the minutes really matter, and don’t be afraid to communicate this with your students. I always explain to my students why I am having them turn in their notebooks in a particular order. I share with them the fact that I have 170 students, so if I have to take five minutes to find a piece of paper for every single one of them, that will cost me 5-10+ hours of extra work just to find the papers to grade. It's just not possible. Being transparent with your students about the grading load can work in your favor. Students will understand why it's important, and for the most part, they sympathize and cooperate. I also like to give my students time in class to get their assignments ready for submission. On an essay due date, this means that I will take time in class for students to staple the rubric to the top of the essay, highlight and annotate specific parts of the essay, and also file their draft work in their writing folders. This makes the grading process easier for me, so I make it a priority in class. Assess students on following directions for turning in the assignment in a particular way. Students always need more practice in following directions, and it will help you as well! 2. Rethink your role from grader to auditor. Your job as a teacher, just like the IRS, is to audit your students' work. Your job is not to grade every single piece of paper that your students write on. So it's really important to prioritize the assignments you need to see vs. the assignments they need to complete. For example, one of the projects I have my students complete in high school is a paragraph portfolio project. You can find a FREE COPY of this Paragraph Portfolio Project in the Bespoke ELA Freebie Library. Subscribe to access the library! I typically have all of my students across grade levels complete the same project in the first semester because it makes it more accessible for me to teach writing skills in shorter contexts. I will have my students turn in a portfolio of ten paragraphs. Of those ten paragraphs, I will have them select two that they want me to grade, and then I will select two more paragraphs at random to grade. Ultimately, I assess their score in two ways. They receive points for following directions and turning in all of the required work. 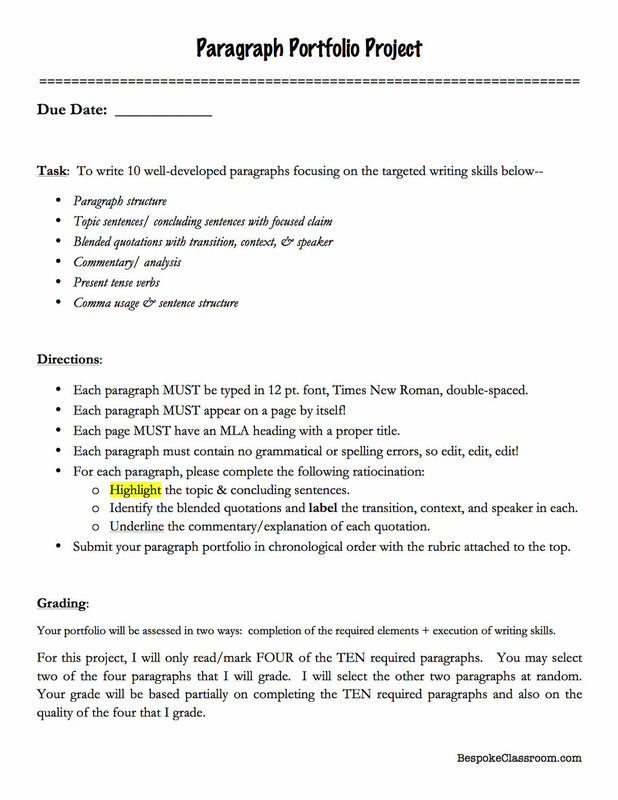 The other portion of their grade comes from the quality of writing on the four graded paragraphs. I audit their work by only looking at a portion of it, but those four paragraphs give me an overall idea of whether or not they have mastered the skills I've been teaching in class. Auditing their work enables me to see what I needed to see while also holding the students accountable for completing the work. So this is what I mean when I say rethink your role from grader to auditor. Find ways to audit work by only grading the most essential parts of an assignment. That way you will not be swamped with grading. 3. Use the power of a randomness in your favor. Randomness is a powerful force. The mere chance of being audited keeps most* people on their toes with their taxes. The same can work for our students. This means to grade assignments at random. Don’t always announce what you’re going to grade and what you’re not going to grade. Likewise, don’t always grade every single piece of paper that you take up from students. Sometimes, I will take up an assignment but not grade it. By taking it up, students assume it's going to be graded. It keeps them on their toes without my having to grade everything they do. 4. Use rubrics and checklists for as many assignments as you possibly can – even homework assignments. It takes me a significant amount of more time to hand write something versus checking it off on a list. So when I give an assignment with certain skills expectations, I turn that feedback into a checklist instead of taking the time to write out the same comment 100 times. Making checklists and rubrics takes time, so I would recommend either teaming up with other teachers in your content area to share the responsibility of creating more rubrics and checklists that you can share, or make it a goal to create a new rubrics and checklists from year-to-year. You could also consider using technology such as Doctopus and Goobric to grade online if electronic grading is easier for you. 5. Use class time to grade. Find opportunities to grade in class as much as possible. For example, if there is a quick homework assignment that I need to check for completion, I will walk around the classroom with my clipboard as students are completing the bell-ringer activity, and I will check off who has completed the assignment right there in class. I can assess work fairly quickly with this method rather than taking up another piece of paper to grade on my own time. I also like to have my students swap and grade reading checks, quizzes, and class work as much as possible. Sometimes, I will couple this strategy with the power of randomness and not even take up the assignment they graded in class, or I'll take it up but not record the grade. This always surprises students. I let them know that I might take up the next assignment for a recorded grade and to be prepared. It really keeps students on their toes! 6. Plan out your entire semester of major assignments before the semester starts. Planning is essential to effective and efficient grading practices. If you don’t know when students are going to turn in an essay, I guarantee that you will pay the price later with grading overload on your own personal time. The more time you spend working on your unit plans and curriculum maps, the more you can maximize your efficiency with grading. One of the things that I make sure to do as an English teacher is to schedule at least two weeks for me to grade essays. I also make sure to stagger due dates across preps so that I do not have 100% of my students turning in major essays at the exact same time. While you may not have every single day of the semester mapped out before school starts, it is essential to map out your major assignments. This is all part of backward design, which is crucial to effective instructional strategy. It's the best practice for both students and teachers. So start with the end in mind and then work backwards, giving yourself plenty of time to grade. 7. Use peer tutors and mentors in class instead of being the only mentor in the room. Your students can be your best asset in the classroom if you utilize them as an asset. For example, if I have my students complete a bell-ringer activity on parallel structure, I can have them swap papers and check each other’s work without turning it in. You can also identify class mentors and make each student an expert on a certain skill so that they can help each other throughout the school year. This is a great way to maximize efficiency in the classroom and still give students effective feedback. Using a peer tutor system enables you to focus your time and energy on working with those students who really need one-on-one time with you. It also enables you to focus your grading energy on the most important assignments rather than assignments that can be addressed in class by peer groups. 8. Use technology to help you grade. What other tips do you have for making grading more efficient and effective? Please share in the comments below! Subscribe to Bespoke ELA today to gain access to the FREEBIE LIBRARY! You will find FREE resources like this and much more! Click on one of the images below to subscribe. Meredith is the founder and creator of TeachWriting.org and Bespoke ELA. She has taught high school English for 10+ years in Dallas, Chicago, and New York City and holds a M.A. in Literature from Northwestern University. She has always had a connection to the written word-- through songwriting, screenplay writing, and essay writing-- and she enjoys the process of teaching students how to express their ideas. An avid tea drinker and anglophile, Meredith enjoys life with her husband, daughter, and sweet pups.